We are in Week 4 of the 100 Acts of Kindness Challenge! This week we were challenged by Alissa at Creative with Kids to Take Care of Ourselves as parents. You can read all about our other weekly challenges on our 100 Acts of Kindness landing page. We only have two days left until our big kindness celebration!! Today we are sharing FSPDT's post, Decorated Hand Sanitizer Bottles- an act of kindness. Jaime has come up with such a useful and simple way to spread kindness! I love it and want to make some of these for our friends. What a perfect gift for Valentine's Day- especially during cold and flu season! Click on the image below to read Jaime's post. While you are over at Jaime's blog make sure to check out her post about 10 Valentine's Things Kids Love and the other posts in her 10 Things that Kids Love series. They are such great resources!! What other ways have you spread kindness this week? Today we are trying to think of some ways that we can thank all of the wonderful people who were so kind to us over the weekend. We are also getting excited to spread kindness on Thursday through participating in International Book Giving Day! Will you be participating in it? We have a special surprise for you that we'll be sharing on Thursday... so make sure you check back! If you are just joining us, head to our 100 Acts of Kindness project 2013 landing page to catch up on our challenge. We are on week 3 and we are having so much fun finding little ways to be more kind and teach our kids about kindness! 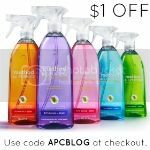 Also, I'm excited to be sharing a little coupon with you this week from Method... along with some fun cleaning tips. You can save $1 off your Method purchase by clicking on the image below and using the coupon code mentioned when you check out. So many great ideas to spread kindness from doing acts to giving books to kid for International Book Giving Day. Thanks so much for spreading the word! You are inspiring me and countless others to make a difference by doing very simple, small things that add up to a lot! Congratulations to you for entering in the 4th week of the 100 Acts of Kindness Challenge. Also, the post about 10 Valentine's things that Kids Love is interesting.